Is your baby’s gum bleeding? 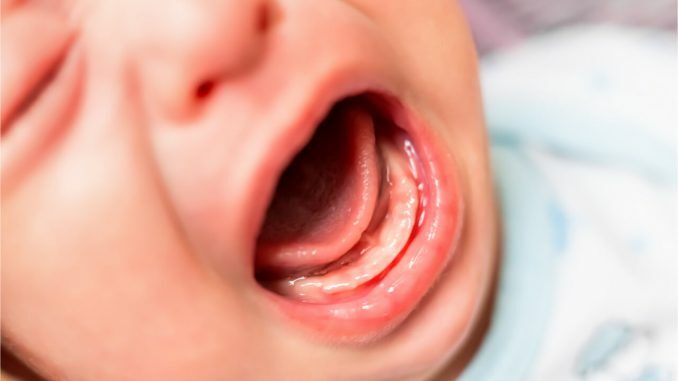 If yes, your baby might be teething. The process can be painful and may cause gum bleeding, drooling, diarrhea and skin rashes among other symptoms. Trying to cope with the discomfort, most babies may cry a lot, refuse to feed and bite on solid objects. A baby bleeding gum should not be a cause for alarm. It’s natural for babies’ gums to bleed slightly when the teeth are erupting. However, if bleeding is accompanied by bruising, tenderness, gum swelling and pain, the cause could be bacteria that trigger inflammation. How does a bleeding gum occur? When a tooth begins to cut through the baby’s gum, a reddish-purple blister usually develops. It is called an eruption hematoma and is just a buildup of blood beneath the surface of the gum. As the tooth continues to emerge, the hematoma breaks and bleeds. That’s when most mothers notice a few drops of blood on their baby’s garments or an object it has been biting. Although teething is a common cause of bleeding gums in babies, there can be other reasons. So it’s necessary to verify that your child’s teeth are indeed erupting. Check its gums and if you notice tiny white spots, those are likely the tips of teeth cutting through the gums. In addition, observe your baby’s behaviors and if it keeps on sucking on its fingers, rubbing the gums with a toy or chewing on solid objects, it’s definitely teething. Excessive salivation is a good sign too, and it leads to a rash. A slight temperature rise and a reduced appetite are good signs too. What to do to help your child? The best way to handle a baby bleeding gum is to massage it gently with your finger. Alternatively, use a wet piece of clean gauze to press the aching gums. As you apply pressure, observe how the child is reacting to know what’s more comforting to them. Moreover, you can give them a refrigerated rubber teething ring as the cold sensation can be soothing. Chilled solid food can also provide pain relief while warm food can worsen the discomfort. If you have a baby who is between 6 months and 3 years old, it will be going through a teething process. Thus, you should expect to encounter an eruption hematoma during this period. Although these can bleed when they burst, the bleeding is minor and goes away on its own. If you notice that your child has severe fever, doesn’t have an appetite, has diarrehea, vomiting or constipation, call its pediatrician.